In the cool waters of the Bay of Fundy in Nova Scotia, Canada, people will find a variety of wildlife while on a boat tour with Pirate Cove Whale and Seabird Cruises. As the boat cruises through the water, a cute Atlantic White Sided Dolphin surfaces to say hello as these animals have fun interacting with boats. The Atlantic White Sided Dolphins are various shades of greys, whites and yellows and can grow to lengths of 9 feet and weigh up to 500 pounds. The main diet of the Atlantic White Sided is smelt, hake, herring, shrimp and squid with their worst enemies being killer whales and sharks. Usually traveling in small groups, they can be seen in larger groups of up to 100 animals. The Atlantic White Sided Dolphin is a very agile animal which will often be seen leaping out of the water. 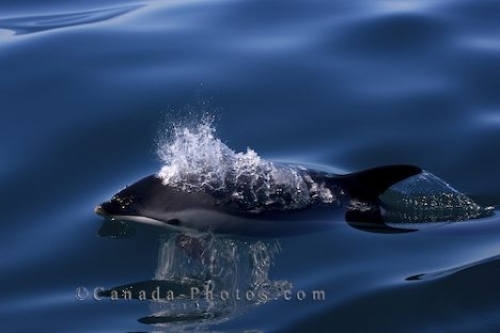 Picture of a cute Atlantic White Sided Dolphin as it surfaces near a tour boat in the Bay of Fundy, Nova Scotia. As the dolphin surfaces, the water bubbles and sprays around its blowhole with the water trailing off its dorsal fin. On this summer day in the Bay of Fundy, the sunlight glistens off the water and creates reflections of the cute dolphin. The boat tours with this company are usually between 3-4 hours in length with 3, sometimes 4 tours leaving daily from the middle of May until late in the fall season. The Bay of Fundy is a summer feeding grounds for many types of marine mammals and seabirds.